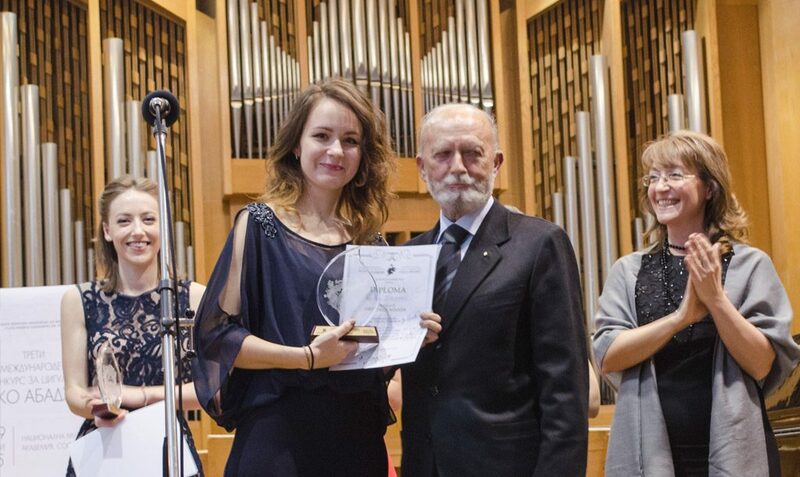 26­ year old Mariya Krasnyuk was the undisputable winner of the Third International Violin Competition “Vasco Abadjiev”. The contest organized by the Club for UNESCO Leonardo da Vinci Sofia ended on Sunday evening by a gala concert with the participation of the symphony orchestra at the fully packed hall of the National Music Academy “Prof. Pancho Vladigerov”. The Ukrainian girl Krasnyuk won against 21 young violinists from 16 countries and took first prize as well as 1500 Euros from the prize fund of 3 300 Euros provided by Unicredit Bulbank. Second winner was Krasnyuk’s boyfriend – Johannes Strake (Germany). “There is no envy between Mariya and me. I am her №1 fan and I am proud of her. At the first rounds of the competition I was №19 and she was №20, so I was going back and forth between the two doors of the hall in order to listen to her playing. I can boldly say that at this contest she played marvelously. She was almost perfect. And she showed so much emotion that she won over the audience”, said Strake who shared the rest of the prizes with the Russians Tatiana Erofeeva and Dmitry Borodin, as well as Sanjar Sapaev from Uzbekistan. Sanjar is a student and representative of the Bulgarian violin school – he studies at the National Music Academy “Prof. Pancho Vladigerov”. The talented violinists, who went through three rounds, were rated by prof. Irina Bochkova from the Music Academy of Moscow and prof. Johannes Maisl (Vienna), as well as by our distinguished professors – prof. Angel Stankov, prof. Joseph Radionov and prof. Nedyalcho Todorov. Honorary member of the jury was prof. Dr. Dimitar Momchilov, president of the National Music Academy “Prof. Pancho Vladigerov”. „We were faced with the enormous challenge to choose among equals”, commented prof. Stankov concerning the third round. There was a requirement to perform a classical concert by Mozart, Haydn or Beethoven. All of the participants had chosen Mozart and it was interesting to follow and compare the different performances. Eventually the professors awarded two third prizes – to Valeriya Sidorenko (Russia) and Aoife Mairead Ni Bhriain (Ireland). . The prize of 500 Euros for „Successful Career Start”, provided by One World Foundation, was awarded to Johannes Strake. Sanjar Sapaev, Dmitry Borodin and Tatiana Erofeeva got the prize “Stefan Balkanski” totaling 500 Euros by Antonia Lavain. A bonus prize of 500 Euros was provided by one of the leading producers of strings in the world “Larsen Strings”. Its owner Laurits Larsen (Denmark) was a member of the jury in the previous violin competitions. This year he provided a set of strings for all participants. „It was a heart-to-heart concert. There was no distance which sometimes could be felt at other European or American competitions”, said the winner Krasnyuk to whom the jury predicted a great future. In February I graduated university in Berlin and now I participate in different competitions and concerts. I intend to take the exam for concert masters. I have a lot of plans and I hope that the impulse of this competition would help me to accomplish them”. The nephew of the notable Vasco Abadjiev (1926-1978), Iliya Karadjov, came for the event straight from Berlin, where h is a famous flutist. His Excellency the honorary Consul of Bulgaria in Piedmont and Valle d’Aosta Dr. Gianni Stornelo, under whose patronage the competition is traditionally held, has also paid his respect to the gala evening. The event was supported by the Ministry of Culture, the Ministry of Education, the Municipality Program “Culture”, the National Commission for UNESCO to the Ministry of Foreign Affairs, the State Cultural Institute to the Ministry of Foreign Affairs, the Italian Cultural Institute, etc. The concert would be broadcast for the first time by Channel 3 as part of their Christmas program. The Program Director of Channel 3 Iva Stoyanova awarded to Sanjar Sapaev the prize for “Artistry and Developed Mastery”. First prize of 1500 Euros to the talented Ukrainian Mariya Krasnyuk. Four second prizes and laureateships for Johannes Strake from Germany, who also took the prize of 500 Euros from One World Foundation. Sanjar Sapaev from Uzbekistan, Dmitry Borodin and Tatiana Erofeeva from Russia got the prize “Stefan Balkanski” totaling 500 Euros given by Antonia Lavain. There were also two third prizes of 400 Euros and laureateships for Aoife Mairead Ni Bhriain from Ireland and Valeriya Sidorenko from Russia.